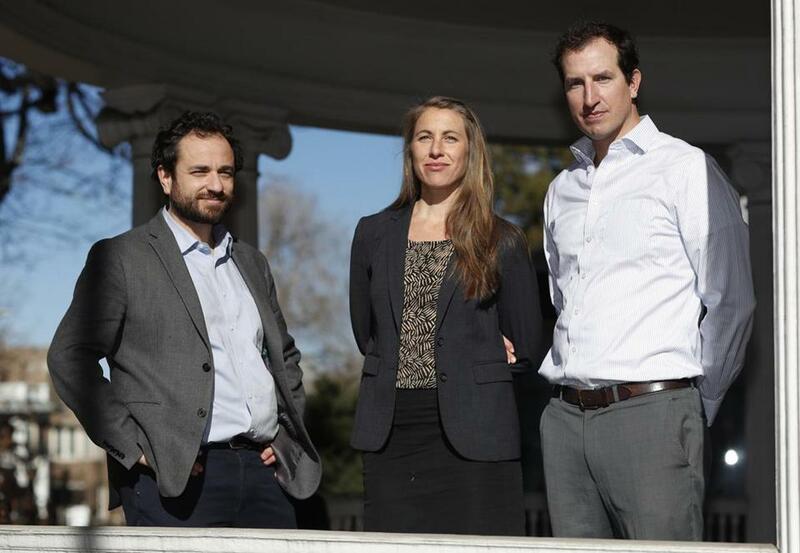 Attorneys (from left) David Seligman, Nina DiSalvo and Alexander Hood of Denver&apos;s Towards Justice are shown outside the organization&apos;s office east of downtown Denver. Nearly 100,000 au pairs, mostly women, who worked in American homes over the past decade will be entitled to payment under the proposed settlement filed in Denver federal court Wednesday, a month before the case brought by a dozen former au pairs from Colombia, Australia, Germany, South Africa, and Mexico was set to go to trial. ‘‘This settlement, the hard-fought victory of our clients who fought for years on behalf of about 100,000 fellow au pairs, will be perhaps the largest settlement ever on behalf of minimum wage workers and will finally give au pairs the opportunity to seek higher wages and better working conditions,’’ said David Seligman, director of Denver-based Towards Justice, which filed the lawsuit in 2014. It was later litigated by New York-based firm Boies Schiller Flexner. Lawyers now need to track down au pairs who came to the US on J-1 visas between Jan. 1, 2009, and Oct. 28, 2018, and have set up a website to help spread the word about the deal. The program, overseen by the US.State Department, was launched as a cultural exchange program in 1986 as demand for child care grew. At first there were only 3,000 participants as part of a pilot, but last year there were over 20,000. The program occupies a gray area between work and an international relations effort, and critics say that makes it ripe for abuse. The sponsors contended it’s not a work program, noting au pairs have cultural exchange visas, not work visas. They have touted au pairs as a cheaper, flexible option for child care since they are paid the same amount regardless of how many children they care for, unlike at child care centers where parents pay a fee for each child, sometimes after spending time on a wait list. In court filings, they argued requiring families to pay more in states with higher minimum wages would destroy the program by making au pairs unaffordable, hurting its foreign policy goals. According to a 2016 report on US child care by the Washington-based think tank New America, the average cost of full-time child care in a daycare center for children up to 4 years old is $9,589 a year for each child, more than the average cost of in-state college tuition. The average cost of full-time care at home with a nanny was $28,353 — 53 percent of the median US household income and nearly three times the annual pay for an au pair. The practice of having au pairs — French for ‘‘on par with’’ — developed in postwar Europe, where young people lived with families in other countries to learn a language in exchange for helping with childcare and some housework. In Europe, au pairs generally are limited to working 30 hours a week. ‘‘I don’t wish anyone to experience anything like this,’’ Azuela, who is from Hermosillo, Mexico, but now lives in Wisconsin, said about why she joined in the lawsuit.